One of my favorite movements recently has been the push to keep gratitude journals. I was raised with the idea that one should count their blessings, especially when one is feeling a little discouraged or down. And I have to admit it helps shake the blues, and the greens. And the yellows. Helping to bring me back to happy. This month, I loved having the chance to not just count some blessings, but also to take time to write them down in a layout. How about you? Does it help you to note the good things? Does your perspective impact your happiness? If so, have you taken time to make a layout about the concept or about a particular gratitude? Perhaps one last look back through our gallery will provide you with the inspiration you need to do just that! Francine - I love how Francine's photos look as if they are hanging on a clothesline, except the line is below them. (So resting upon?) I think the design adds to the hominess of her layout. Karen - Did you notice that Karen's layout is filled with elements that are a tiny bit askew, tipped to the left, tipped to the right, a little up, a little down... and then there is the photo grid. With its even borders and symmetrical placements. Such a stabilizing element. Perfect. Celeste - The digital magic of Celeste belongs to her use of shadows. Look closely at the grid squares and how the shadows make them so slightly raised. Even the stiches have a teensy bit of shadow. It is this that changes the layout from digiboring to digireal. So small, but so impactful. EmilyS - Do you sometimes make a list and want to use numerical embellishments but can't get them all on a page? How do you decide which to use and which to let go? Follow Emily's idea. She just picked a few, then placed the selected flair in appropriate places that make sense from a design perspective. Next, add the journaling around it. Easy peasy. Or so Emily makes it look. Donna - The use of this quote card is genius. It adds a title, a decorative element, and a nice balance stylistically to the photo. Donna has a remarkable sense of balance in her layouts, without resorting to symmetry. This layout is one of many that shows this off. Aly - Hands down, my favorite part of Aly's layout is that she is in her birthday photo. Hooray to Derek for taking hold of that camera and helping preserve Aly on her birthday! LisaO - Have you seen those maps with pushpins that show where people have been? Lisa's layout reminds me of those. I love the visual story told by the hearts. Such a useful design element. Amy - Did you read through Amy's journaling? It was so delightful. And sincere. And didn't have much at all to do with the days the leaves were thrown about. Photos can really be a jumping off point for stories, good stories, important stories. If you let them. Paula - Oooh, I love a good list of things that are important. I love a good list that doesn't look like a boring old list. And I love the idea of keeping track of one thing per day. Such a lovely idea. Diane - I have one word. Buttons. I love them. And I don't see them much anymore. But Diane used them. Beautifully, might I add. Thank you, Diane! Marnie - Do you see the title? Do you see how the line of the r lines up with the left edge of the photo? Which lets the swoop of the g rest nicely in the swoop of the parentheses. Oh, I love fonts. LisaK - Even though Lisa's photo is busy and contains many colors and details, you still notice her husband and children first. She wisely pulled the colors of her daughters' dresses into the layout. And by putting one little frame with a white center (the one to the right of the frame which says, "these girls") next to the photo, the white of the girls' sweaters pulls right out of the picture and the girls take center stage on the layout. As they should. Erin - This layout has a fantastic collection of patterned papers. Small dots, chevron zigzags, stripes and big dots. In varying shades and colors. So delightful! Erin is so good with her papers. Keshet - Ever notice how Keshet uses the tiniest elements to draw things together? For instance, did you notice the teensy yellow sequence that dots the "i" in her title is the same one strung across the collage in the top left corner? We often speak of repetition as a means of tying elements together. This is a perfect example. Marie - Do you love these photos? Aren't they yummy? I also love how there is a second story going on on the left hand side with the bitty little journaling strips. Clever. Kelly - Lining up her elements down the center of the page, Kelly's little Gabe gets front and center billing. With the journaling paper running the entire height of the page, the top photo becomes the focal point of the layout. A helpful design strategy. Vivian - Using images and ephemera rather than photos, Vivian captures the story of her day even though she had no photos. Do not be deterred by photoless days when there are still stories to be told! Monika - I love the idea of putting the journaling snippets on flags. It is so much more interesting than bullet points! Have you thought of other ways to journal lists without using a list? I hope you were able to be inspired, too! Please, oh please, if you make a layout, will you load it to our Flickr gallery and leave me a link so that I might oogle your creations? I would love that! Wrapping up Project Life week. I love Project Life. Love. It. And it's funny, because prior to New Year's Day, I was certain I wanted no part of it. I just didn't get it. I was fine with my regular scrapbook pages and didn't need to add another project to my ever growing to-scrapbook list. But then I read the first paragraph in this post by Lisa Truesdell and it just clicked. It all made sense. I was in love with Project Life and I wanted to get started right away. Except that I couldn't. While I got the core kit I wanted, Amazon was sold out of the page protectors and I just couldn't do anything without them. I needed to have everything in front of me to work on it. So I waited, collected receipts and photos and random bits of life, jotted down some notes and waited some more. Finally the end of February came, PL product was restocked and I got started. Of course, this meant I was behind. Two months behind, but I didn't let that get me down. I completed the first two weeks and then I realized I needed to work on the current weeks before I forgot too much. Even though I'd been trying to keep notes of our activities, funny sayings and memorable events, I couldn't remember them all. So I started on the current week and have gone from there. At some point I will go back and complete those pages, but they're not a priority right now. At this point, I've completed Weeks 1, 2, and 8 - 12, with 13 and 14 partially done. So yeah, I'm a couple weeks behind again, but that's okay. I'm not going to stress about it. It starts with the pictures. I keep my pictures for Project Life organized by week on my laptop. To do this, I go through each days photos choosing the ones I like best and copying them in to the proper PL week. Ideally I would do this weekly, but it usually ends up being every couple of weeks right now. I don't always use every photo I first consider, I will pare them down once I'm working on that week. I crop and print them in PSE, but I don't really do any editing other than the occasional lightening of a dark photo. When I start working on a week, I begin with the photos. I pull up that week's photos and have my album and notebook open to the corresponding spread. Having it all open together helps me plan out my week by identifing where I might have journaling without a photo, deciding what size to print, figuring out if I need a "quoted" or other specific journaling card, and to remember any milestones or events to include. I use sticky notes to decide where each photo or journaling card will go. Once my pictures are printed, I cut and place them in their correct pocket. Then I go through all my cards and figure out what ones I'll need, putting them in the pocket with the photo. I like to get all that done before I start on the fun stuff: adding photos to cards, embellishing, writing my journaling. Here are a few more weeks I've finished. I've been figuring out what works and what doesn't work for me over the last two months.It's an ever-evolving process, that's for sure. I like my weeks to have some sort of color scheme. It's just what works for me. I find it more visually appealing when things go together. My PL week runs Monday - Sunday. This is how I think, and makes the most sense for our family. When laying out my week, I try to place the beginning of the week on the left side, end of the week on the right side. But only if it works. It's not a rule, and if the pictures I've chosen and stories I want to tell don't fit that way, then I don't worry about it. I love the day stickers that came with the kit. I use a couple per week on the photos and cards, but don't worry about each day being identified. I'm not using as much ephemera as I thought I would. I'm keeping things, because I know at some point I'll have a week where I'm short on photos/stories and it'll come in handy. But so far, I've had a ton of photos and easily filled the weeks. But I don't anticipate that always being the case. So far, I've only included some tickets, a party invitation, a drawing by my younger daughter, and a story written by my older daughter. One thing I dreaded in the beginning was using my own handwriting. I hate mine. It's messy, really hard-to-read messy. But using my own handwriting saves me some time and it ensure my handwriting is in at least some of my scrapbooks. So I'm sucking it up. I'm keeping my pages pretty simple. I tend to use simpler journaling cards, only embellishing them with an arrow, strip of paper, label or the like. I might do more as I go on, but for now that's working for me. I'm not really doing many 4x6 photos. I've often split those pockets up in to two 3x4 pockets with the journaling cards. About those two 3x4 cards in the 4x6 pocket. Turns out the cards kept moving around. And it was annoying. So I had to solve the problem of shifting journaling cards and this is what i came up with. When the stories on the 3x4 cards are unrelated, I take that week's 3x4 cards and place them upside down. Then I adhere a scrap piece of paper (here a used sticky note) to it, holding the cards together. Next I adhere the next week's photos back-to-back, creating a 4x6 spread that won't move around. When the two cards I'm putting in the 4x6 pocket are a related story, I use my Tim Holtz Tiny Attacher to staple the cards together. Of course, it took me weeks to figure this out, I just kept putting the cards back in. But in case someone else is having this happen to them - problem solved! Product wise, I'm using the Clementine kit, along with various label stickers, accent stickers, tags, paper scraps, punches, small letter stickers and stamps. A lot is from my stash, but I have purchased new label stickers. I'm using product from October Afternoon, Jillibean Soup, Studio Calico, 7 Gypsies, Heidi Swapp, Ormolu, Making Memories and others. While I love the kit (especially the grey cards, days of the week and arrows), I found myself wanting more variety in journaling cards. I've found a ton of great ones online. Some I've purchased, but plenty are free. These Dotted Frames cards are simple which I love, and their variety of colors will go with any spread. They give a fun pop of color while leaving plenty of room for journaling and pictures. The Cardcreator Digital Set by Bananafishstudio is really great. You control the design, colors and sayings. I'm still playing around with it as doing anything other than basic editing is new to me. 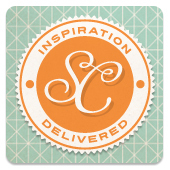 Looking for more printables and inspiration? I have a Project Life board on Pinterest and you can find it here. But first, here are two more printables from the WCS team today. You can download these cute Quoted cards from Marie (and seen on the right side of my week 14 spread) right here. And these fun cards by Monika here. I'm going to be honest here. This takes me a long time. Like, way more than just 2 hours a week which seems to be the magic number. When I read some blog posts about how that person only spends a couple hours per week putting their week together, I think huh? Because that's not me. Maybe it's because I'm indecisive, or it could be I'm also playing Words with Friends on Facebook, but regardless, I spend a lot of time on each week. Because of that, I haven't been scrapbooking any regular pages lately. So if you're like me, you're not alone. Everyone does this differently, scraps at their own pace and that's okay. Maybe my process will get quicker, maybe it won't, regardless, I love the end product and it's totally worth my time, all way-more-than-two-hours of it. We hope you've enjoyed our Project Life week. If you're posting your PL pages on a blog or in a gallery, please share! We'd love to check out your pages. PS, While I've pretty much neglected my blog for many months (as in the header photo is of me pregnant with my youngest...who is now 19-months-old), I will be posting my Project Life pages starting next week. Hi everyone! What I love about Project Life is how flexible it is and, today, I wanted to share a litte bit about my story of how I use the Project Life structure to tell our day-to-day stories as they happen. I was first introduced into the idea of Project Life four years ago, when Becky Higgins created a kit called Project 365 for Kit-of-the-Month club from Lisa Bearnson. I loved the idea and was already taking a photo every day so I bought two of the kits when they went on sale. The kits were sold towards the end of one year, so when the new year began, I immediately started using my kit. I printed my photos, put them in their sleeves and wrote on the little journaling cards that came along with the kit I had. A few months in, I quit. What's important to note here is that I never quit. I am not one of those people who starts several projects and then walks away. I tend to pick my projects carefully and then stick with them all the way to the end. But not so for Project 365. I prefer smaller photos and just putting pictures page after page felt like putting together a photo album (but more work) and the page didn't feel substantial to me somehow. It also felt like I was posting the photos on my blog daily and then printing them and doing a lot of repetitive activities that I didn't enjoy. Since I disliked both the larger photos and the journaling cards, it was easy to think that I disliked the whole structure of Project Life. This was partly because I already wrote a blog daily and a lot of the work I did felt repetitive and time-consuming. But then something interesting happened. For 2012, I chose "savor" as my one-little-word. I had begun practicing gratitude regularly and wanted to increase my awareness. Pay more attention to my life as it happened. Savor all the little moments that everyday life and miracles are made of. So I created something called The Savor Project. I loved the idea of the project but I needed to find a different execution. That's when I finally revisited the Project Life structure and realized it could totally work for my personal goals. I still had my second kit from four years ago and decided to give it a try. Create 6x8 mini-layout-like pages. Stitch, have fun and then cut them in the middle, so they fit vertically into the 4x6 slots. Since I have very specific art-related goals this year, too, I use the bottom sections that are originally for the journaling cards, to store copies of my art from that week. Even though most of the stories come from that week, I don't keep track of the date. The goal is to have a collection of small stories from that year in one album. and then I add stitching and then cut the papers in half. I can prep the pages ahead of time and then if my week is really busy all I do is stick the photos (which are are stickers so require no extra adhesive), write some journaling, and add a title. I don't have to have photos from the whole week, I only need four stories. Sometimes even fewer if there was a big event. For example, my son's birthday took four sections to cover so all I needed were two more stories that week. I get to use a LOT of my stash. This is like mini-scrapping. So I feel the same sense of joy and accomplishment as I do when I scrap but it's much faster. Because it's a story based approach, it covers that week's stories much more deeply than if I were trying to do a general review of the week. These are stories I'd usually be scrapping. It's like making 4-8 scrapbooking pages a week, but MUCH faster. I haven't yet, but if I do end up completely missing a week, there's no way to tell that by looking at my album. Even though it's sequential, it doesn't specifically indicate a timeframe on each spread so I could easily have one spread span two weeks (or even a month!) if I wanted. The only reason I am sticking to a spread a week is cause I want to. And most importantly, while I do get to play with a lot of product (and use my unacceptably large stash), I love that this is about preserving stories. For me, it's all about finding a way to savor our moments. I love that when I am living those moments, I get to enjoy them. When I process the photos, I remember them once again. And when I sit to do this project, I get to live them a third time. I am always filled with so much gratitude for my life when I look at my pages. For me, product always comes second. Things are in fashion only for this moment. And years later, I might not care for the embellishment I was in love with now. But the memories are eternal. They will make me happy and fill me with gratitude forever. So I keep my focus on them. Before I end, I wanted to share today's downloadables with you. They are by the awesome Marnie! You may download the colored version here and the grey cards here. And there is one more set that coordinates with the printables from Tuesday. Aren't they magnificent? Thanks Marnie!! So now, to conclude: Whether you like my personal way of approaching Project Life or not, the one takeaway I hope you have today is that the Project Life system is super-flexible. There's no rule saying you have to use the cards that indicate a particular week. There's no rule saying you need to print 4x6 photos. You don't have to use the journaling cards. You don't have to use anything you don't want to. You can make it work for you. For your particular likes and dislikes. For your personal goals. I can tell you that it's worth taking the time to find a way that makes it truly work for you. Remember that, at the end of the day, this is your project. You are doing it the people you love and for yourself. 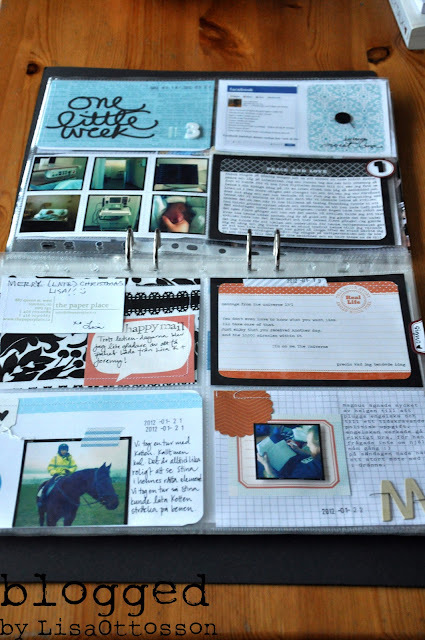 Hello, and welcome to Day 3 of our Project Life Week here at write.click.scrapbook! Today I wanted to share a bit with you of my personal experience with Project Life. I decided to embark on the Project Life journey at the very last minute...literally sometime during the first week of the year. Luckily I have some friends who were willing to lend me some Becky Higgins page protectors, and I had an old, unused Project 365 kit that I could use until I got my "official" Project Life products. Before I began this project, I knew it would be a challenge. I have two young children, I work a full time job, and my husband has a job that includes a "busy season" which is finally wrapping up now. This means my scrapping time is very limited. When I made the decision to take on Project Life, I established a few rules for myself in order to be successful. Some I have followed...others I have not! Rule #1: Stay caught up. Alright. Let's be real. "Keeping up" has been an epic failure. The first few weeks I was "allowing" myself to have one full week to finish the previous pages. My weeks run Monday - Sunday, so if I didn't have my two page spread finished by the following Sunday, I considered myself behind. I was doing really well...but then life got in the way. I am currently about a month behind. The only consolation is that I am a teacher, and luckily I will be off of work in about five weeks (26 weekdays, but who's counting!? ), and I will hopefully have time to get caught up. I think the biggest downfall of this project for most people is the idea of keeping up with it all. I will be honest. It's really tough to find the time. There are nights that I am barely "free" until after nine p.m. and there are a million things I would rather be doing, but I remind myself of how worthwhile the outcome is. I have tried very hard to resist frustration by keeping it simple and just getting it done, which brings me to my next rule. My biggest time-eater in scrapbooking is that I'm terribly indecisive. I will start something. Then change it. Then change again. Once in awhile I will make an entire layout, find something I hate about it, and decide to change it all at the end. It's a problem! I told myself that if I was going to be successful with Project Life, I needed to work quickly and not worry so much about all the little details. I told myself that unless there was a major error, I was not allowed to change things. I have mostly stuck with this rule, though I admittedly have recreated a few journaling cards and added some embellishments after the fact, when I felt like the spread needed more. Sometimes it's so hard not to make changes, especially when I see all the other amazing Project Life pages out there. Which is why I came up with the next rule! Rule #3: It's all for ME. So, you should know that I'm breaking this rule right now by posting my Project Life pages here!! When I began Project Life, I knew how popular it had become in the scrapbooking world, and I knew that there always would be someone else's out there that was neater, better, cooler, and more fun than mine. I told myself that I was not going to give into the hype and put my Project Life out there for everyone to judge and compare, because ultimately it is a project for ME and me only. Yet, here I am posting it for you to see. ;) Honestly, with the exception of this post, I have not posted my pages anywhere else other than my personal blog. I am not letting myself worry about what others think, because I truly love this project...and it really is all about ME! Rule #4: Use up the stash. If you are like me, you have an embarrassingly large stash of unused scrapbooking product. I vowed when I began Project Life that I would not buy anything new solely for Project Life. I was going to use up all my old product. Again, I have done a pretty decent job of not breaking this rule. I have purchased some little things like label stickers and some more of my favorite alphabet stickers, but other than that, most of what I use is not new. It is actually pretty fun to include some really old things that I otherwise wouldn't use on a layout!! Now that you've read my "rules" (which, in retrospect all seem to have been broken, but hey, that's what rules are for, right?!) I thought I'd share just a bit of my process. Everyone has their own way of completing Project Life, and I firmly believe that there is no one right way to do it. You just need to find what works for you. And this is what works for me! Throughout my week, I keep track of events using a little notebook. I also have the Momento app for my iPhone which is great because it pulls information from various other places (Facebook, Instagram, etc) and keeps them all together in one place. I also have a basket of memorabilia sitting on my counter. It's probably not the best place for it, but that way I can just toss stuff in as I get it. Every week I begin by looking through my photos and putting all the potential pictures into an album in iPhoto. Based on the number and orientation of the photos I decide which page protectors I will use for that week. Former w.c.s. team member Marcy Penner has created some super helpful printable templates for each of the designs. These are a huge lifesaver for me! I sketch out my plans, use my Selphy printer to print out the photos at home, and I get to work assembling it all! I do not create "chronological" layouts, but rather put everything where it fits. This means Monday might be on the right page and Saturday might be on the left page, but that's okay with me. Once I have all the photos printed, I put them in their allotted spaces. I also temporarily stick in any memorabilia. This gives me a general idea of what each page will look like. I usually choose a simple color scheme for each week. For example, Valentine's week was pink, red, and yellow because it needed to match the brightly colored Valentine's for my kids that I had included. After my color scheme is decided upon, I pull together all kinds of goodies from my stash to finish it off. Every week I am sure to include a "title card" indicating the week and the dates, as well as a "This Week" card with highlights of the week. I like to add little bits here and there to create a somewhat cohesive looking two page spread. I often will choose several pieces of scrap paper and use them in various places throughout the week. I use a lot of journaling stickers, alphabet stickers, and punches! I also include the occasional 3-D element on the outside of the page protector. I have really come to love assembling my Project Life album. I find it very satisfying to accomplish little bits of it each night. I also love including the small things that I would never create an entire layout about. And finally, I love that my kids love looking at it with me! In my opinion, this is what scrapbooking is truly about!! Would you like to see the final product? Here is one of my favorite weeks of Project Life! Thanks for letting me share with you my Project Life thoughts and process. If you are currently working on Project Life, I'd love to hear what some of your challenges are and if you have any tips for success. Have a great Wednesday and Happy Scrapping! ps. what would a day be without a little printable? Please enjoy! You may download the grey version here. You may download the pink version here. You may download the teal version here. Hi there! It's Celeste here and now you can see the final results of growing out all the dyed hair. I look a tad older, but it's certainly nice not having to spend one Saturday a month at the hairdresser! More scrapping time for me! Back in December, I watched as scrapper after scrapper posted their cover pages for 2012 Project Life. I was on the fence for awhile. I looked into purchasing the Project Life system from Becky Higgins and completing it in paper, but as I was adding up the costs and time I just knew I wouldn't do a great job with it. Also, by the time I made my decision most of the page protectors were sold out! I scrapbook almost exclusively digitally now, so a digital solution made more sense. Then I heard that Becky was selling the templates and kits digitally at Jessica Sprague - a low initial investment and templates too! I was sold. I purchased the Clementine kit and the templates. And started my cover page. I saw this great cover page from Stephanie Howell and loved how she did the journaling. So I stole that idea from her. The rest came together quickly. My journey down the digital Project Life route had begun. Each week, I start with a blank page in a paper journal and I write all the days of the week on it. Then I fill in events I know are going to happen that week. Each evening, I write down other little things that happened or photographs I took. If I don't have a photo, I'll go on the web and grab one - like movie posters, photos of the interiors of restaurants, places my kids went without me, etc. Paula Gilarde, fellow WCSer, is also working on an annual project. She took on P365 this year, but she's doing her pages in a Project Life style. I love how she has her seven photos with a simple journaling card and some embellishing. Another digital example that makes Project Life easier! I typically use templates and I love these digital page protectors from Valorie Wibbens. She sells templates that fit them perfectly. I stick to the same design a lot as I find it takes out some of the decision making for me. Former WCS team member Marcy Penner's Hello Forever journaling cards are amazing. I adore that Polaroid Camera and the starbursts! Geralyn Sy's Sayings Journal Cards are bright and fun. So glad she decided to open a store and share her creations! Robyn Meierotto's Die Cut Frame Cards look like they were cut with a Silhouette! I love how a little color from paper underneath peeks through! Penny Springmann has a monthly themed kit that is perfect for using in Project Life. I especially love that monthly paper in this kit. I've used that paper for my title card at least once a month. Peeps & Milo's Geometrik Love Journaling Cards - funky, fun and colorful who could ask for anything more? Erica Hernandez is an amazing scrapper and a phenomenal digi designer. I love her graphic esthetic. These journaling card templates can be recolored however you like! CLEVER! Those are just a few. Paper scrappers be sure to check out digital stores. Many digital designers are producing digital journaling cards in both 3x4 and 6x4 for Project Life. A lot of these cards can easily be printed and used over and over again. I set a goal for myself to take more photos in 2012 and to tell more stories. Project Life forces me to run and get my camera more often. I'm also capturing lots of little details that normally wouldn't make it into my albums. Photos of myself, photos of my husband, and just more photos all around. It really has been a great boost to my picture taking. My boys will even tell me to get my camera that this needs to go in for the week! Amazing really! The downside is sometimes on Sunday, I don't feel like scrapping or I don't have time. I've managed to always complete the last week before the next one is over. Sometimes I don't want to bring my camera and I don't have a good camera phone so I'm forced to lug it around. Not fun! Think I can convince the husband to buy me an iPhone 4S?? Overall, I'm really pleased that I have been doing this. I feel I'm covering a lot of events that sometimes I just don't feel like scrapping later. I think I'll be really happy to cover most of Christmas this way, for instance. My boys are enjoying looking at the pages on the computer, but I plan on printing them all in a book or putting them in an album at the end of the year. If you are participating in Project Life, I'd love to see your pages. Share them in the Flickr gallery and I'll leave some love. ps - a few little freebies for you! You may download itty bitties here. You may download our life here and our days here. Welcome to a new themed week! This week we are going to talk all about Project Life. It seems that this year, Project Life has blossomed. You can find it on blogs and sites everywhere! And we have several team members that are keeping their own Project Life projects. Before I show you my Project Life, do you all know what Project Life is all about? Well, let´s give a little background. Becky Higgins is the mind behind this project. Think of it as photo album scrapbooking in a fast, easy, and weekly format. Becky has created several products to help make the process even easier. With page protectors in several sizes and arrangements, and note cards for decor and journaling, in just a couple of hours each week, you will have a place to keep track of your everyday life, be it photos, notes, shopping lists, receipts, report cards... anything you would like. By pairing your pictures and words with these basic products, you will be able to tell your story, in your own way, resulting in a complete album. The Project Life line of products has grown to also include many other items that enhance the memory-keeping process for those who want to do more. This week, five of us are going to show you our take on Project Life. Some of us use Becky´s products and others has made the project their own with other methods. Everyday will also have a freebie printable or two for you to use in your own Project Life albums, or for your scrapbooking pages. I started my Project Life album the first week of 2012. I really wanted to use the products that have been made for the project, but as I had a hard time getting hold of them (since I don´t live in the US) I bought some page protectors that I found at my local bookstore and a binder and got started. The page protectors have four pockets, so every week make 8 pockets where I can just slide in a photo or journalingcard. Here is a look at my third week, just to show you how a week would look like in my album. I often use the pockets to hold my photos. Some weeks I make most of my cards (that's what I call the things I put in the pockets) digitally. Meaning that I open my photo in PSE and add digital brushes, overlays and my journaling and then just print everything out and it is ready to put in the album. I love this option since I can work on my cards even if I am not home to use my scrapbooking supplies! Mostly this project is hybrid for me. I bought a few digital journling cards from different online shops that I print out and add my handwriting to and then use with my photos. This project is a great stash burner, since you can use scrap pieces from other projects to jazz up your Project Life cards. Some weeks have more stuff than others. This image above shows my birthday week, so I wanted to include the cute birthday cards I recieved. I simply added a smaller page protector and put it inbetween my ordinary weekly pages. I have used my phones camera alot for this project. I have an app that allows me to upload and share my photos online (much like Instagram) and I download all the photos that I want to use in the album and print them out. These photos (above) show the size that they actually come out of the printer without me resizing them. They fit into the pockets fine and I still have room for journaling of whatever I cant to add to the card. Here (above) is an example of the phone photos in a smaller format. This was I can fit in a few more on each card and still have room for journaling. A few times I have created photo mosiacs to be able to use lots of photos on one card. You can create mosaics on a number of online sites, but I usually use bighugelabs.com. And lastly I use 6x4" photos from time to time also. I have included all sorts of things in my album. For example, our weekly menu, movie tickets, weather forecasts, stuff from Facebook, snail mail and emails, books e are reading, creative stuff I am working on, inspirational quotes, Tv show favorites and business cards. A few weeks I have also had a lot of words. I have made an extra pocket that I have placed over a pocket on my regular spread and placed journaling under a photo or something else. That way I can easily just flip the top pocket to read the journaling instead of getting the card out and take out any additional journaling. I don't just include stuff and stories that are happy. Our life goes up and down and things happen that are tough. During my third week I spent many, many hours holding my grandmothers hand while she passed away. I included that and the story that went with it. I have since then used my journaling from my Project Life album to make a special layout about that time. My life includes depression and anxiety. That´s in there in the album also. Some days are better than others and I tend to use the extra pockets to include hidden journaling. I have also included inspirational quotes, emails and comments from friends and blog readers. I am a team member of Ella Publishing's Take Twelve project and I have included my Take Twelve photos in my Project life album. I love that I started this project. First I was afraid that this would mean I wouldn't make my ordinary scrapbooking layouts, but that has not been the case. On the contrary, I have been able to go back to see which stories I have scrabooked or not by just flipping through my Project Life album. I haven't fallen behind (yet!) but one thing I have been struggling with is the plain and ordinary weeks when nothing special has happened. Don't get me wrong, I LOVE to record the everyday, but I like to have a twist on that somehow. My solution has been to focus on a few particular things those weeks, meals, books, the weather etc. The thing I love the very most about how this project has affected my life, is that my husband and daughter also contribute to the album. By sending me their phone photos I can include events where I wasn't attending. I love that! I have also asked my daughter to journal about her weekends etc. I hope that you can take soemthing from this post and be inspired to make your own Project Life! Download colored weatherman here and the grey version here. Oh goodness, what a fantastic baby week! Not only did I get to see all the amazing layouts and projects from our team, but I also got to hold a tiny 5 pound baby, and loved loved loved every minute of it. I am often sad that my tiny baby stage has passed. Was I the only one to shed a tear or two while reminiscing? This month, we are going to base our sketch and template upon Celeste's gallery layout. Not only does this template work so well for showcasing multiple photos, but it also seems like a perfect sketch for a card. And for your scrapbooking pleasure, we have created a layered template for you. Click here! I often pretend to not care about trends. But that doesn't stop me from noticing them! And Diane's gallery layout uses two hot trends beautifully: hexagons and chevrons. I double dog dare you to use at least one of them on a layout! And if you try putting both on one layout, be sure to measure your proportions carefully! For example, Diane's use of the hexagons is bigger than her use of chevron, and is done is a faint hue, both of which let the patterns add to her page and not take it over. Monika kindly created a printable for us this month. Gosh, she is just so talented! If you would like to take home your own copy, you just need to click here! Look at what a cute layout she made using it! Thank you for stopping by! And because you know I don't issue a challenge I am not wiling to accept, here are my layouts to go with our challenges! I hope they help inspire you to create your own! 1. April Sketch AKA Just Call Me Celeste! 3. April Printable AKA I Love It All, Too! Enjoy your weekend! Here is a challenge reminder (to add to your Pinterest account)!